Mouthwatering baked Parmesan Garlic Chicken Wings are the perfect party appetizer, game day food or tasty snack. They can be prepared with either fresh or frozen wings. Fall will be here before we know it and it will be all things football and basketball. Is there a better way to enjoy friends, family and good food? 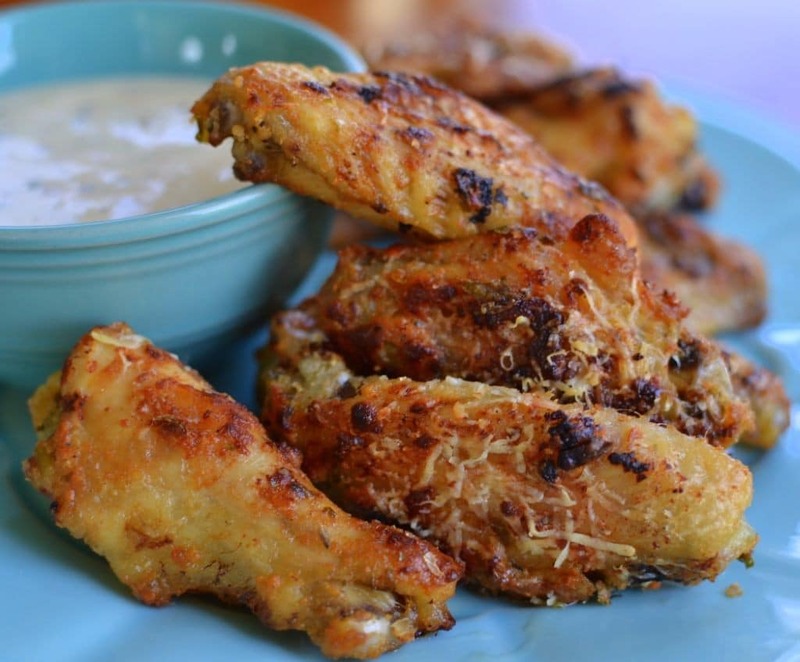 These Parmesan Garlic Chicken wings are delicious, easy and perfect for game day. 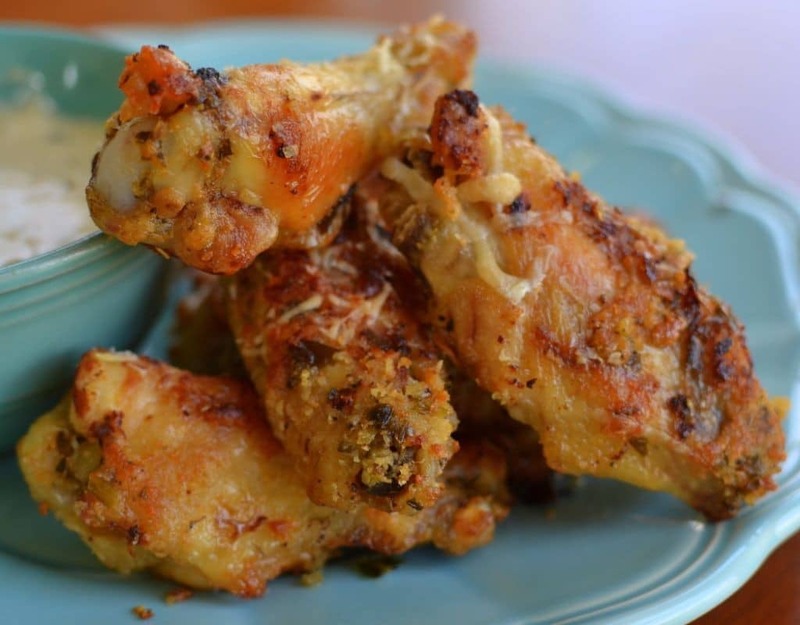 Better yet this weekend is father’s day and this garlic Parmesan chicken wings recipe would hit the spot just right. These beauties are baked not fried and the recipe can accommodate both frozen and fresh. You can serve with any kind of dipping sauce but my favorites are blue cheese and ranch dressing. They are coated in garlic, Parmesan cheese and a perfect blend of spices! They are so full of tantalizing taste bud flavors!! Are you doing any entertaining this summer or fall? In my world there in never a bad time for having friends and family over. Here are some more amazing appetizer recipes! 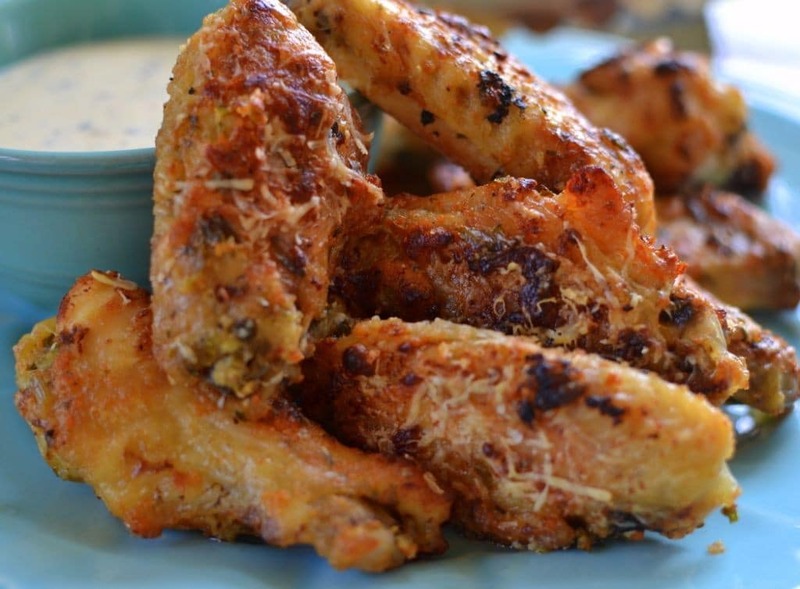 Here are some helpful hints on making these Parmesan Garlic chicken wings EPIC!! I like my wings extra crispy. You should adjust the time based on how crispy you like them. Frozen wings will take a little longer than fresh wings. Use fresh grated Parmesan. It is worth every penny because it is flavor packed. For added crispiness turn the broiler on the last minute of cooking but stay close because broilers are unpredictable. They are delicious with our without sauce. One bite of these and you will want to eat all of them! This recipe has been slightly modified at the request of readers to include cooking times and a slight increase in Parmesan cheese! You can use fresh or frozen wings. Bake wings until light brown; approximately 40 minutes. In large bowl combine butter, Parmesan cheese, garlic powder, onion powder, pepper and parsley. Gently fold in wings. Return to cookie sheet and bake an additional 10-20 minutes depending on how crispy you like them. For added crispness turn broiler on for the last minute of cooking. These look delicious, thanks for the receipe. My chicken didnt turn out crisp..what did i do wrong? I would guess that yours needed little more cooking or another 1-2 minutes under the broiler after you roll them in the parmesan/butter mixture. When I cook my wings I always cook them a few minutes longer than the directions say. I don’t know where you live, but I live about 5 miles north of Boston, MA. When I buy chicken wings, they don’t come with baking instructions. Maybe you live somewhere where they do. For the rest of us, it would be super helpful if you would include baking instructions in your recipe. Seasonings sound great! Preheat oven to 375 degrees and cook the wings in the preheated oven 1 hour, or until crisp and cooked through. Happy Cooking! Going to make these wings tomorrow they look so good and will be having my home made macaroni and cheese. These look delicious! We love wings at our house and I can’t wait to try these out. One lady told me she has fixed them four times! LOL! To fold you mean to mix in with sauce and do I cook the wings first than add sauce and cook for another 10 minutes ? Yes that is correct and you need to cook the wings pretty crispy both times. I have never made wings at home. In step 1 where you say bake according to instructions. How long do you bake them and at what temp? They look so good! Thank you! You know I followed the directions on the back of the frozen bag of wings and then I added ten minutes or so until they were pretty well done. If my memory serves me correctly it was about 70 minutes at 375 degrees. Let me know how they turn out. i like a little more garlic and spice. i added a tsp of chopped garlic and cayenne pepper. soooo good, thank you for inspiration. Thanks so much! I like them too! So glad that you do too! what Temp & how long should I cook the wings? Are they fresh or frozen? Frozen – Preheat oven to 400 degrees F (200 degrees C). Arrange frozen chicken wings in a single layer in a shallow baking dish. Bake in the preheated oven for 25 minutes, then flip wings. Continue baking until the skin is crispy and meat is no longer pink at the bone, about 20 minutes more. Fresh – Preheat oven to 375 degrees F (190 degrees C). Bake wings in preheated oven for 30 minutes, or until cooked through and crispy. Can u use ckn tenders in place of wings? Not sure. A couple of things come to mind. A chicken tender does not have skin on it so I am not sure that the Parmesan mix would stick to them. I would think that you might need to coat them with mayo first. Also the cooking time would come down quite a bit as wings have skin and are also dark meat so they stay more moist. since many are confused by the “cook wings according to directions” but you give no directions could you just edit your recipe to include the cooking instructions instead of us having to look in the comments? I, too, have never seen or purchased frozen or with instructions for baking. I get mine at Trader Joe’s and separate the joints myself. I would have known about how long and hot to bake them, but many apparently would not. Editing your recipe would be a great help. I will do that early next week. Thanks for the advice. In the middle of a bit of chaos right now but I will put it on the schedule. I made this Parmesan garlic chicken wings and my family loved it. Thanks for sharing this recipe. Thanks so much. I love crispy chicken wings. Deeeeeeeelish! Making these tonight, and I just read where you said to use frozen wings. Why? that should have been stated at the beginning of the recipe. I don’t understand why some of you are coming down on Beth so bad about this recipe, any GOOD cook should be able to figure out for themselves how long to cook wings, it is not her fault if there is no instrutions on frozen wings,and if they are not frozen you should be able to judge how long to cook them if they are not frozen. my rant is done. BTW I understand the recipe fully. Thanks so much Carole! I appreciate your kindness and support. You are so welcome my dear.Some of those remarks really upset me. Have a great day my dear. Used drumettes instead – Very good! Will use this recipe again. Browned and crunchy just like fried!! Yummy! Sounds delicious! Thanks so much! these chicken wings look great. I was wondering if you can precook these at the first cooking then do the second time later? I have never tried but I can not imagine that it would not work I think if I was doing that I would cut the time down on the precook by a few minutes and make up for it on the back end if needed. I hope that makes sense! How come there is no garlic in the recipe? Thanks so much! So glad that you like them. We love these wings!! How many wings are considered a serving for calorie purposes? I am not really sure. If separated like in the recipe maybe 4-6. I would like to put these out on a Christmas buffet. Can they be made ahead of time and reheated? Yes. It would be better to reheat in the oven versus the microwave and I think I would cut the first cooking time by about ten minutes knowing that you are going to pop them back in the oven for a reheat. How many calories are in your wings? I made these for my husband for NYE using fresh wings/drummies. He kept raving about how good they were! Flavorful and crispy – there were none left by midnight. I’ll bring this recipe into the new year and then some. Thanks so much for such a sweet comment. So glad that he liked them! They are delicious treats! This just looks delicious!!!!! WOW!!! am not a fan of chicken but this put my mouth watery! Ok now these wings sound like they would be right up my street! What a delicious idea to do with them. I have to admit though anything with parmesan included gets my attention. This looks amazing!! There is going wrong with wings and Parmesan, I just never considered mixing the two! I’ll be happy to try this soon. My family would go crazy over these! I really need to make them some very soon. Those would be great for a family game night. Yummy must have! Thanks so much Sara! I hope you enjoy it as much as we do! Wings are one of my favorite eats. I could eat them as a meal or an appetizer. I look forward to making these! These look absolutely amazing! If you’ve got any suggestions as to how long I might cook them in an air fryer I would much appreciate it! I literally loved your pictures. They are so delicious. I am a veg but I want grab one piece now. Parmesan Chicken Wings look so good. I would like to cook it on weekends. So yummy!